Hello there! If you could only eight favorites, would you manage? I listed eight of my favorite Prima products and that was even harder as there's so many great ones! The original post went live in Prima's blog a couple of days ago (link). Like I sad, picking just eight out of the bunch was almost an impossible task! Some of the products I knew immediately but, the others, needed some pondering. I just love the awesome spectrum of mediums the company has and picked several in my list. I used these eight and just a few pieces of paper to make my three ATCs. You can see my choices on top and read the explanations underneath! Heavy Gesso White - The white gesso just had to be on the list as it features in most of my crafts. 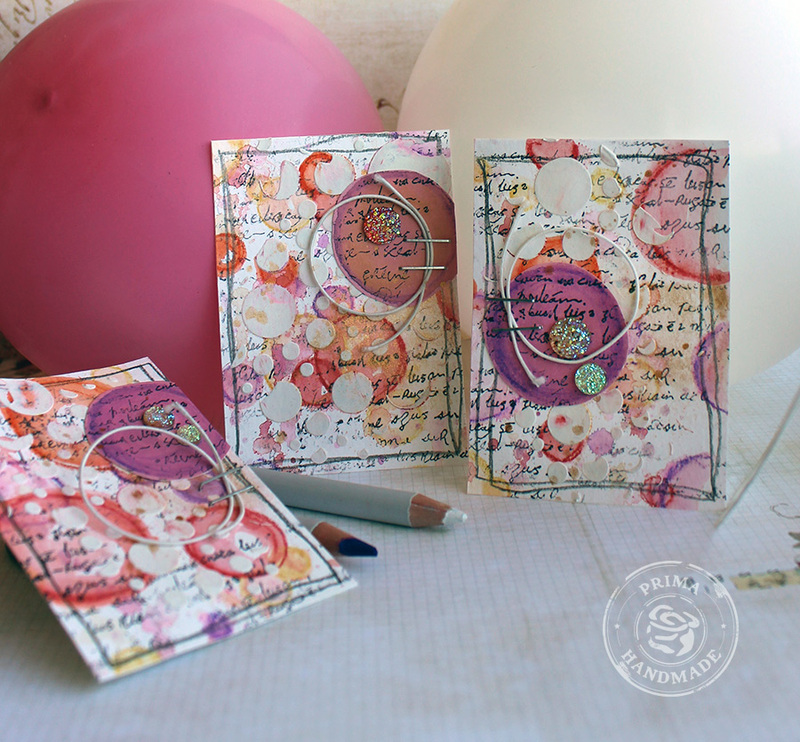 Clear Stamp Messy - I also use stamps in most of my projects, so a stamp just had to be there! And above all the script ones Prima has, this is my favorite – just the right style to add some interest but nothing too definite! Watercolor Pencils – Basics - I’ve had some watercolor pencils before but only when I got the Prima ones I started really using them! Great pigment, easy to use and so versatile! You can even journal and craft on the go with these! 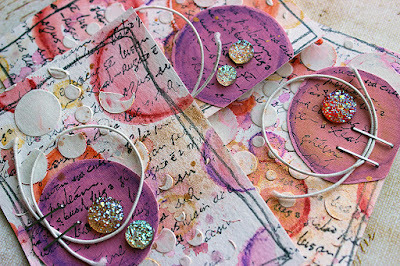 Mica Powders Gold and Pink -I adore all the Mica powders but, somehow, I gravitate always towards the gold and pink ones! Bubbles Stencil – First there was the 12x12 and now there’s this smaller one of the great Bubble design by Finnabair. This stencil fits in every page because of the ingenious design – bubbles for everyone! 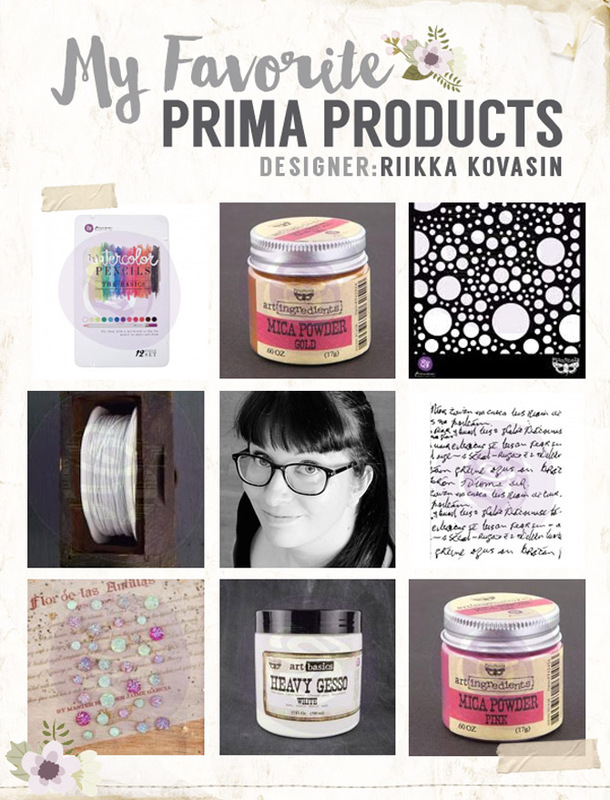 You can use it to mist, draw, create texture, cut or ink – possibilities are endless! Wire Thread Ivory and Say it in Crystals “Cigar Box Secrets” - Luckily while picking my favorites I realized that project-wise some embellishments might be nice as well and included the fabulous wire thread and the sweet crystals to my eight. Now you now my eight favorite ones! It was so fun to do these cards using these and almost no more. As I didn't even list paper on my favorites I had to add a few pieces so I could have anything done. But only a few pieces were enough as I chose to make a set of ATCs. 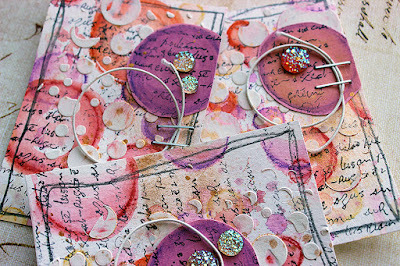 Bubbly, colorful ATCs! Thank you for stopping by today! Have a great weekend!